OfficeOne is a comprehensive and secured All-In-One rich media communications suite for the enterprise, the voice over IP service provider and for Application Service Provider portals. OfficeOne brings fully functional interactive voice, text, video and collaboration capabilities to any desktop, laptop or connected PDA in the organization – providing employees with an unprecedented set of intra-company communications tools. The OfficeOne IP-based solution uses the existing corporate data network to provide a truly secure and converged voice, data and video solution. Users can now do all of their communications within a single network connection. 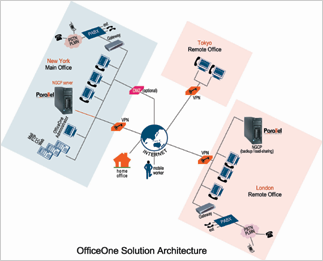 For extra communications security, OfficeOne servers reside within the organization’s Inra-net which also called Virtual Private Network (VPN).